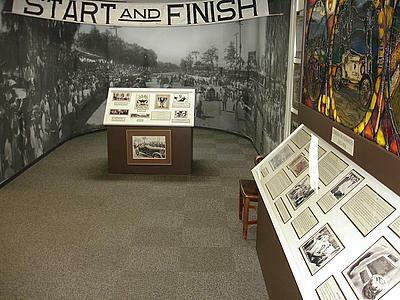 Corona Heritage Park & Museum displays a 20-foot long by eight -foot high diorama of the races held on the circular road around the city. Like Indianapolis, Ind., Corona is called the Circle City. Also, like Indianapolis, Corona has hosted some international auto races. Unlike Indianapolis, Corona's racing days are long gone; however. But, what happened at one of Corona's races had an impact on race car drivers for years to come. In 1886, developer Robert Taylor and his partners formed the South Riverside Land and Water Co. and purchased 12,000 acres of agricultural land west of Riverside. He hired Anaheim engineer H.C. Kellogg to design a circular road around what would encompass the settlement of South Riverside, renamed Corona in 1896. The perfectly round, 2.77-mile-long dirt and oil road encompassed homes, stores, churches and schools. As the city developed, it became a citrus-growing giant, with groves to the south of town and the packing houses and railroad to the north. Corona was shipping out more fruit than any other town in southern California by 1913. On Sept. 9, 1913, in observance of California Admissions Day, the first of three international automobile races, the Corona Road Race, was held on Grand Boulevard. Mary Winn, vice-president of the Corona Historic Preservation Society, said that city fathers had decided to use the race as a draw for residents for the city, because at that time, a lot of cities would get a good start, but then fail. She said the city printed up 20,000 postcards to give to residents so they would mail them to advertise the race. Over 100,000 people came to the small rural town of 4,000 for the race, and Winn said the Hotel Del Rey and other hotels put people up, while some camped out on the roads leading into town. Bathrooms for the crowds were at the Corona High School at southwest Grand Boulevard and Main Street. Food vendors were along the race route. Special trains helped bring in people from Los Angeles, San Diego and San Francisco. "The motto of the first race was 'Safety First,' which was a hoot since they had spectators on telephone poles and rooftops," said Winn. Famous car drivers of that time, including Barney Oldfield, Terrible Teddy Tetzlaff, Earl Cooper and Ralph De Palma entered the race. Cooper won the first race, 109 laps long, along with the prize of $8,250, which was second only to the purse at the Indianapolis Motor Speedway. The race was held again the following year in November. The road was paved for the first time for the race, which was won by Elias Pullen. The race was not held in 1915. Winn said that rains had washed out some roads into the town, there were problems getting sponsors and the race hadn't been as successful as organizers thought it would be. "Wild Bob" Burman, who had set a speed record in New York of 129 mph, entered the Corona race in 1916 with a blue Peugeot. He led most of the race, but when one of his wheels broke, he went over the curb and into a telephone pole at 100 mph, killing his riding mechanic and a shop owner Sam Spear, who was working as a security officer. Fifteen other spectators were badly injured. Burman later died in a hospital. The race continued, however, and Eddie O'Donnell won it in a Duesenberg. Winn said that what is left of the race is an historic marker at Grand Boulevard and Main Street which marks the start and finish lines. The Corona Heritage Park & Museum is located at 510 W. Foothill Parkway, Corona. Information: (951) 898-0687.